Data: Can you identify the specimens in this photo? They were collected on a beach near Neah Bay, BC, Canada. There were a bunch of them connected together at the base and all attached to what looks like a piece of algae. Each capsule is about 7 mm long. My theory is that they are the egg capsules of a pelagic snail like Janthina janthina or something related. 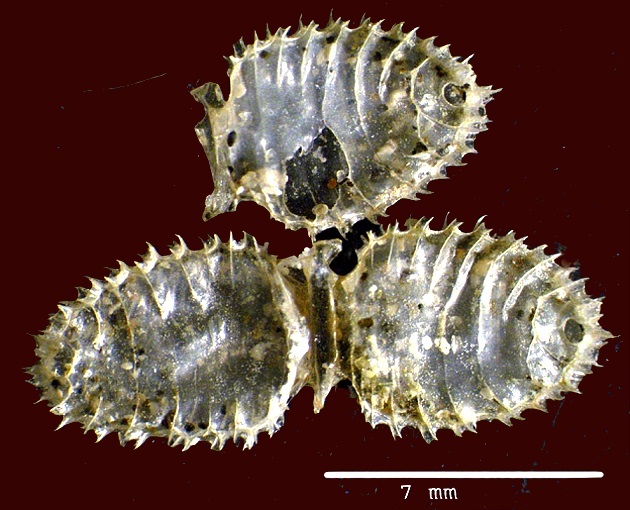 The opinion of several (Ron Shimek; Alan Kohn, Roland Anderson) is that your egg case is from Nassarius fossatus. They generally lay many capsules as shown in the photo by bernie hanby- attached. Individually they have the spiny features that are not so obvious in a group photo (below).